This entry was posted in Class, Photo Tip and tagged calculation, course content, lunar, moon, night photography 111, photographer's ephemeris, reference, TPE on October 27, 2011 by Steven Christenson. If you are finding these articles useful, please spread the word. Share us, Tweet Us, Digg us. Like us on Facebook. And if you would like one on one instruction please consider a Star Circle Academy Workshop. Now back to your regularly scheduled program. The amount of moon illumination changes daily. 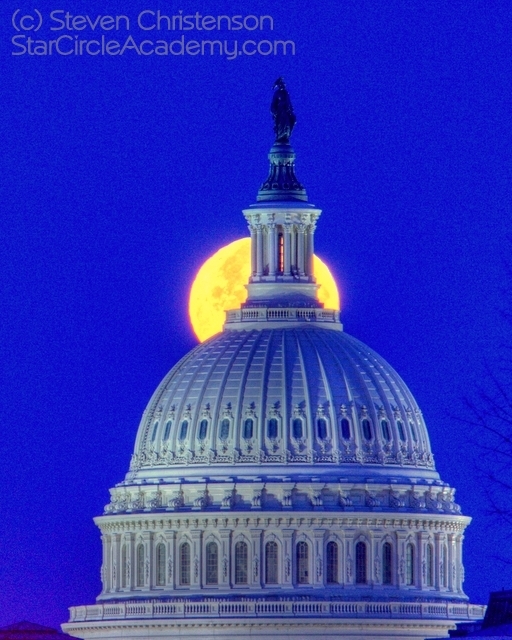 The moon’s rising and setting location must be accurately calculated – and it changes daily. Exposures to capture moon detail require the right amount of foreground illumination. The site chosen must have an unobstructed view of the sky in the desired direction. To get a “big moon” it is necessary to get far enough away from the foreground. If too close, depth of field problems may arise. A well supported telephoto lens is required. Capturing a shot of the moon near the horizon means the atmosphere must be relatively clear of clouds, dust and haze and when very low in the horizon there is more atmospheric distortion. Figuring out how to tackle the moon location is computationally challenging. Fortunately with the internet there are many free resources to aid in this endeavor. 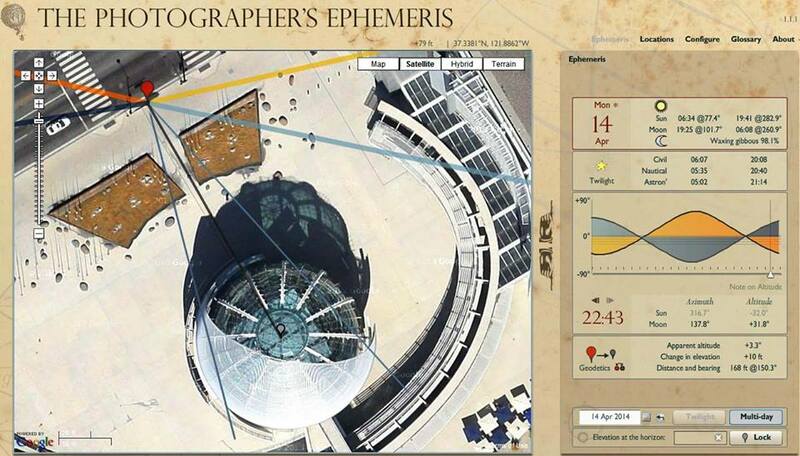 And more fortunately, there is one tool which is almost ideal for the task: The Photographer’s Ephemeris. We will address the problems step by step. Obtain the appropriate camera gear. Calculate how far away we want to be from the target. Identify possible vantage points to shoot that target. Verify (visually, if possible), that the target is viewable from the vantage point and that there is sky behind our target. Verify that the moon will pass near our target and at an opportune time of day. Determine how high in the sky the moon should be. Fine tune the location to be sure the geometry is correct. The camera gear element of the puzzle is easy: get the longest telephoto lens available. 2,400 mm will work great with a 35 mm (full frame) camera. I do not have anything that big (or expensive), so I use a 70-200 mm lens with a 1.4x extender on a 1.6 crop factor camera. That effectively gets me focal length. The “short” focal length of 448 millimeters means I can not fill my frame with the moon – it would take 32 moons laid out in a grid. Getting more foreground in the shot creates more opportunity for an arresting image however. Besides, those really big lenses are not only expensive, but unwieldy. In fact, they call them telescopes! Working with a crop camera in this scenario is a benefit. No telephoto? Well then I probably would not bother – at least I would not bother trying to capture moon DETAIL. The moon is obviously one of our targets, but we want something interesting in the foreground to pair the moon with. Ideally we want a target that clearly stands above the surroundings and preferably one that allows us to get the proper distance away to maximize the “big moon phenomenon”. How far away? Here is an easy formula: multiply the height of the object by 114.6. If the object is 100 feet tall, the proper distance is 1,114.6 feet away. If the object is 20 meters tall, the distance is 2,292 meters. If 6 inches, then a distance of 687.6 inches is about right. For the curious, the number 114.6 corresponds to , where 0.5 is the number of degrees of the angular size of the moon from anywhere on earth. If shooting from somewhere else in space more advanced trigonometry may be needed. It might be tempting to start with something short and nearby, like a golf ball. But getting a good depth of field is going to be difficult. Let’s get started on the target, shall we? 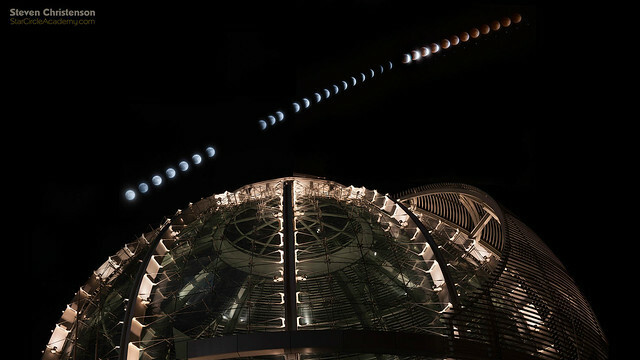 Fire up The Photographer’s Ephemeris (TPE) and follow along with me. 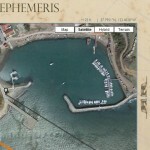 Switch to Ephemeris Mode (it is the first selection in the upper left). In the search bar (lower left), enter “Pioneer Park, San Francisco, CA“. Now would be a good time to make the TPE window as large as possible, and select the “Satellite” mode in the map. Right above the upper right corner of the map you should notice two things: an elevation (here shown as +190 ft), and the GPS coordinates (37.8…blahblahblah). If you prefer metric (or it shows metric and your prefer feet, you can change that using “Configure”). Looking at the zoomed in map, put the cursor over the map near the bottom and click and drag upward. The map should move and soon you should see a conical shape casting a long shadow. Hooray. 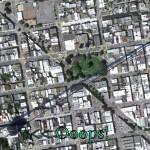 You found the Coit Tower. Double click in the center of the structure and it should look about like this. Here I cheated and moved the elevation (+266 ft) and the GPS coordinates on to the image from above the map from the bar above. I also zoomed out a bit so you can see the parking lot that you first landed on. Did you notice that the elevation moved up from 190 to 266 feet? You gained 76 feet in just a few parking spaces! It is steep there, but that number is NOT a measurement of the height of the tower, my friend. That is the elevation of the BASE of the tower. Don’t believe me… click a few spots near, but not on the tower or the building. Click things farther away if you like, I’ll wait. As you can see from the image at left taken from the parking lot, there is clearly not a gain of 76 feet between the two places. The elevation information comes from a variety of sources, mostly the United States Geological Services (USGS) data. What you hopefully learned is not to COMPLETELY trust the elevation shown. The elevation does not include buildings or trees and is not that precise, but it will probably be good enough. In a while you will need to know the height of the tower above the base. Guess where you can find that? Yep, Google. Did you find it yet? It’s 210 feet (65.4 meters) tall. So doing the math: ideally we’d like to be 210 x 114.6 feet away (24,066 feet or 4.5 miles) to have the moon’s apparent size be as big as the tower. Unfortunately going to the east, our choices are mostly in the San Francisco Bay, farther away on the Oakland Shore (near the Bay Bridge), or closer. Treasure Island looks like a good spot. It’s 2.11 miles and there is a lot of flat, publicly accessible shoreline to move along to align the moon behind the Coit Tower. And besides even though the Coit Tower sits up on a high hill, only about the top half of the tower is above the sky line. So 2.11 miles might work out very nicely. 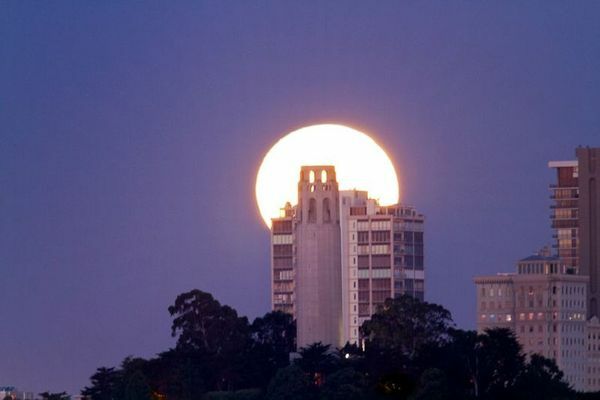 Since we have chosen a site to the east of the Coit Tower when can the moon appear behind it? Near moon SET of course. If you want your diagram to look exactly like mine, change the calendar to June 15, 2011. And change the Ephemeris mode to “Detail” (use the D key, or click the box down near the calendar). When you switch to Detail mode, a hollow little gray marker will appear. Usually to the right of the red marker near the right edge of the map. Don’t lose it – you’ll need it in a minute. 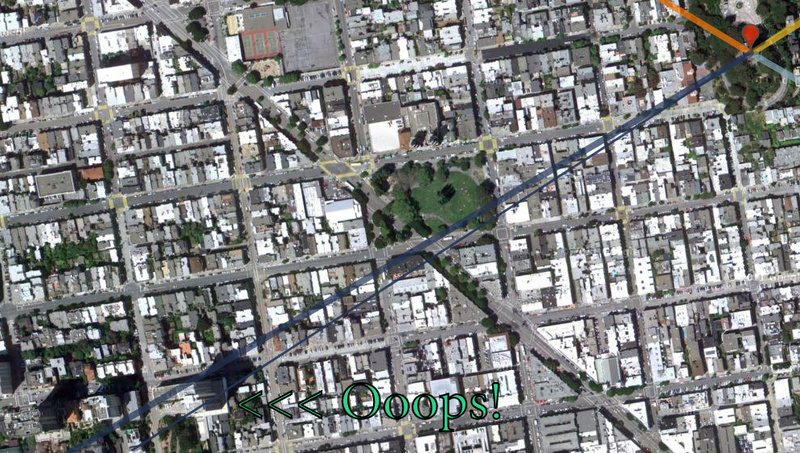 You may have noticed all those colored lines extending from the Coit Tower in Figure 2. Here is what they mean: the light yellow line is the direction of sunrise, the orange line is the direction of sunset. The light blue line is the direction of moon rise and the dark blue is the direction of moon set. All by itself that won’t help much. To see the moon setting in the west behind the Coit Tower, you obviously must stand to the EAST. But where? Figure 3: Sun/Moon graph and time slider. I have stripped off all the stuff around it to focus your attention. You’re focused, right? Now would be a good time to play with the time slider. Click and drag it. Whoa! Did you see the lines moving? The skinny ones, that is. There is a lot going on here, but the one thing you’re not yet seeing is where you need to stand to see the moon behind the Coit. Stephen Trainor, the author of TPE put a cool feature in this tool. He did so because I asked politely and I support him with donations – I urge you to do so too. 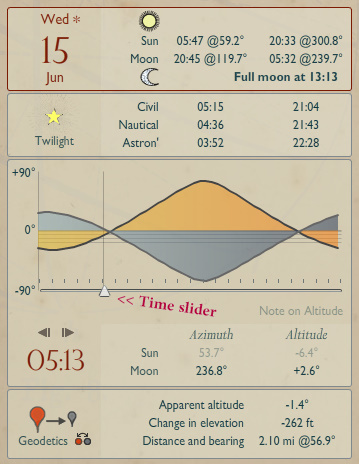 Buy his iPhone/iPad version of the tool (or Android if that’s available) or make a donation if you’re using the desktop (free) version of the Ephemeris. It’s the right thing to do! Move your time slider to 5:13 as in Figure 3. Now hold down the shift key. Did you see the thin blue line jump out? That blue line traces roughly where the shadow of the moon would appear. It can’t be completely accurate, however since the exact location would have to take into account topography, trees and man-made structures. We helped ourselves around that worry by choosing a flat shoreline where not much can get in our way. Now would be a good time to find that hollow gray marker. Lost it? Click “D” then “D” again. It will appear near the right side of your map connected by a dim gray line to the red marker. Hold down the shift key again, and drag and drop the gray marker on the Treasure Island shore DIRECTLY over the dark thin blue line. Zoom in if you have to and get the marker EXACTLY on the line. And try not to stand behind a building or a palm tree. You probably didn’t notice, but three things appeared at the bottom of your Ephemeris Graph in the box labeled Geodetics. Those are: Apparent Altitude (which here will be negative), Change in Elevation (also negative), and Distance and Bearing. Each time you move the gray or red marker it will recalculate the distance, altitudes and angle between gray and red. One last little coup for now… notice next to the word Geodetics it has a little red and gray dot with an arrow over the top? Yeah, click that. The gray and red locations magically flip. Now all of your altitude and elevations will be positive. The calculations are FROM red TO gray. 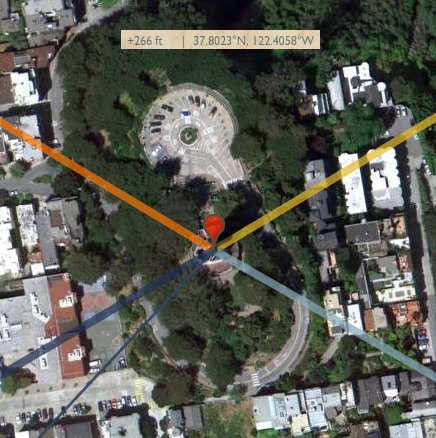 Since red is at sea level now, and gray up 266 feet on the top of Pioneer Hill the angle above the horizon toward the hill is positive: specifically the base of the Coit tower is 1.1 degrees above the horizon. So can we conclude that the moon must be 1.1 degrees high in the sky? NOPE. Sorry, we can’t. So close and yet SO far! Q: What is wrong? Did you figure it out? A: TPE has no idea how tall the Coit Tower is! (Stephen tells me one day he’s going to add the ability to specify the height at the red or the gray marker), but for now, YOU have to make that adjustment yourself. I’m afraid it’s going to involve some math. Trigonometry, actually. What is the CORRECT Angle? Or in this case InverseTangent( 210ft / 11311ft ) = 1.06 degrees. So the CORRECT altitude is 1.06 + 1.1 or 2.16 degrees. Hint Use the built in calculator in MS Windows in Scientific mode (Alt+2). Set the units to degrees. To get to the inverse tangent function (also called tan-1) use the “i” (inverse) key. Now that we know the moon altitude must be 2.16 degrees we do not have to start over. Let us make sure the red maker is back on the tower and adjust our slider until the moon height is 2.16 degrees, then follow the line of the direction of the moon set to get our new location. Of course if we move significantly higher, lower, nearer or farther away we must recheck the angle calculations. In a hilly or mountainous location it is extremely non-trivial to get all the heights and angles just right. Using the “Terrain” mode of the map may help, but changes of a few dozen feet may make a big difference in the alignment. The satellite maps may be out of date. A tree, building, crater, fence or obstacle might be in the location you want – or directly in front of it. Terrain maps are not visible when zoomed in. Elevations of the terrain are ROUGH. Moving 10 feet to the left or right may make or break the shot. I am NOT available to solve your trigonometry problems! Ok, I am but there will be a fee! To get the ideal scenario for moon details AND foreground light, it helps that the sun is on the opposite side of the sky and sometime during Civil twilight. In Figure 3, above, notice how the time we arrived at (5:13 AM) has the moon 2 minutes before Civil twilight. Wondering what Civil twilight is? It is the legal equivalent to either dusk or dawn. Dusk when the sun has set, dawn when the sun has not yet risen. Signs that say park hours are “Dawn to Dusk” mean something quite precise. But those times change daily. For more click on the word “Civil” in the Ephemeris and it will tell you! Or take a look here. The ideal exposure for detail in a full moon is about 1/100 of a second at ISO 100 and f/9. But atmospheric conditions, and the moon’s altitude may significantly affect the settings to use. 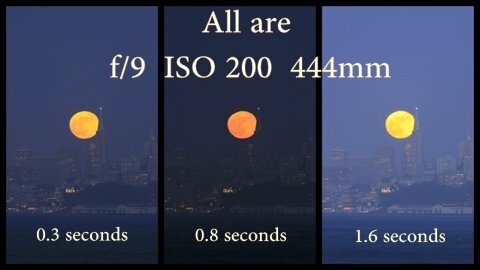 The best choice of aperture is to stop down enough for a sharp shot that keeps the foreground through to infinity (the moon’s focal distance) in focus. If your foreground is at or beyond your hyperfocal distance (as it most probably will be), you’re good to go. The problem, of course, is that your foreground is probably not going to fare well unless it is also well lit – so bracketing your exposures is always a great idea. The darker the twilight, the wider the bracketing needs to be. The moon is in the right spot, but, whoops, there is something else in the shot, too! A big square building blocking the view behind the tower. A more thorough scouring of the map in Figure 4 might have revealed the problem (see Figure 5). Behind the Coit, and set up on a hill are a series of apartment buildings. From almost anywhere else on Treasure Island, or Fort Baker in Marin, the Coit tower sits all by itself on the skyline. There is no substitute for direct observation from the planned location. Any number of things can be a problem from light posts, billboards, trees and shrubs to, well hulking square buildings in the line of sight. Extra scrutiny of the sight lines in TPE *might* save one from a needless trip to get a direct observation. Knowing the local topography helps as does picking a structure or formation that clearly stands above the surrounding area. First I am a hater of images that have been composed by dropping a well exposed (oversized) moon into a separately taken landscape. There are technical challenges to embrace here so why not embrace them! Besides my desire as a scientist and engineer is to maintain reality through honest acquisition. I am not, opposed, however, to using technology to overcome the limits of technology. Namely a camera can not readily capture the range of exposure – brightest to darkest – that the human eye can so a trick called “High Dynamic Range” photography (also called tone compression, tone mapping or image fusion) is sometime a necessity. 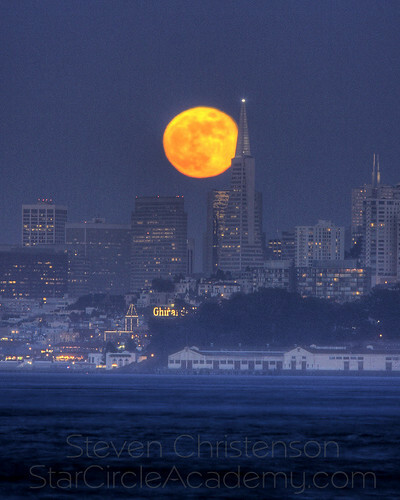 In the morning of June 15th, moonset behind Coit Tower was the target as describe earlier. 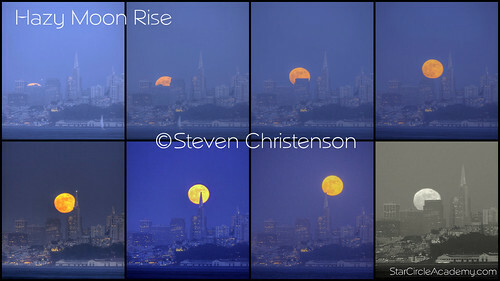 That evening, moon rise behind the Transamerica Building was the goal. You can click the diagram to the left to see where we were. As kismet would have it, the very parking space that I had calculated at the correct spot was open and I pulled in! The haze was heavy, contrast was low. But in the end, the moon peeked (and peaked) right on schedule and right where it was supposed to go. It is always satisfying when things work out like that. More satisfying if the weather is great. I can only imagine what having a clear day to shoot in might have accomplished. Best of luck on your alignments! Comments, questions, praise, quibbles over the math – we’ll listen. Find us on Facebook. Or attend one of our workshops. 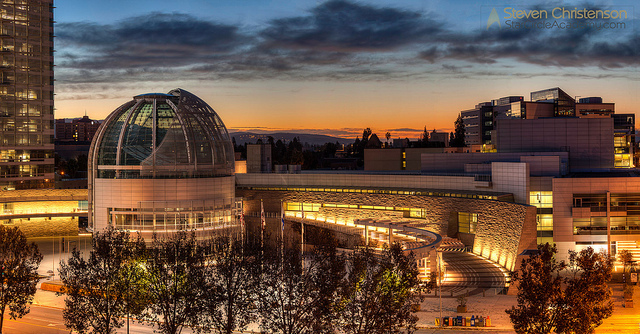 Want to keep it cheap, hook up with me, Steven in the Bay Area Night Photography group. This entry was posted in Creativity, High Dynamic Range (HDR), Photo Tip and tagged alignment, altitude, angles, atmospheric distortion, azimuth, elevation, exposure, moon brightness, moon phase, obstructions, planning, The Photographer's Ephemeris, TPE, trigonmetry on June 17, 2011 by Steven Christenson.